EHA » Hydrogen industry first in responding to EU’s call for clean transport investment. Hydrogen industry first in responding to EU's call for clean transport investment. The last day of September might become the first day of a step change in hydrogen refueling station development in Europe; after challenging rounds of negotiation, six partners in the German ‘H2 Mobility’ initiative – Air Liquide, Daimler, Linde, OMV, Shell and Total agreed to an action plan to develop a network of 400 refueling stations in Germany by 2023 with already 100 in place in the next 4 years. Total investment will amount to € 350 mln. by 2023. The network could become the blue print for further roll out in Europe as envisioned by EU’s Clean Power for Transport Package. 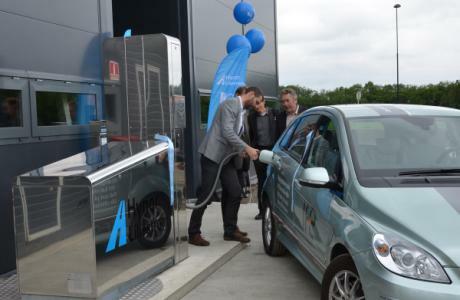 Starting form a network of 15 public stations this initiative will forever change the pace of hydrogen development in Europe. The 100 stations will be servicing the first fuel cell vehicles rolling off series production lines in 2015. Soon first customers will want to cross borders and citizens in European urban centres outside Germany will be demanding these “better” technologies on their roads as well. Therefore the coordination of current national H2 Mobility initiatives, that have started in for example Scandinavia, UK, France and the Netherlands, is key to allow a sustainable roll out that matches industry and customer expectations. Also in view of the EU ambitions with the proposal for a Directive on the Deployment of alternative fuels infrastructure the role of the EHA and its national member associations in explaining the status of hydrogen applications to key national and local stakeholders seems even more needed now. At the mid term conference of the CHIC fuel cell bus project, financed by the FCH JU at the Open Days in Brussels on October 8, it was emphasized that the willingness of various stakeholders to accept hydrogen applications is high but that many regional stakeholders also stressed that is high time to deliver…..the EHA salutes its industry members Shell, Linde and Air Liquide that have now taken up this challenges and invites the EHA membership community of large industry, regional and local authorities, small and medium sized companies, research institutes and universities to follow in their footsteps and change the pace of H2 deployment in Europe and beyond!